Refresh your style with this charming Lavender Leather Layered With Glass Bead Daisy Flower Wire Band Ring. 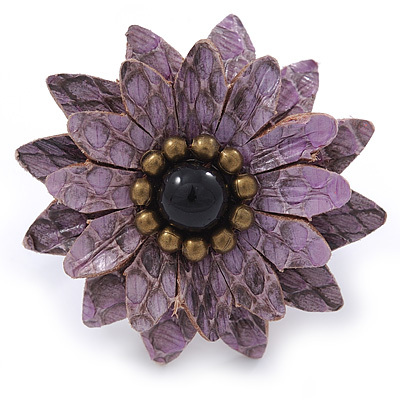 Featuring a daisy shape flower design, made of lavender leather petals and garnished with glass beads in hues of black and brown offering a unique look. The head of the ring measures about 40mm in diameter. The band crafted from flex, silver tone wire and covered with dark brown cord. Will fit all sizes.